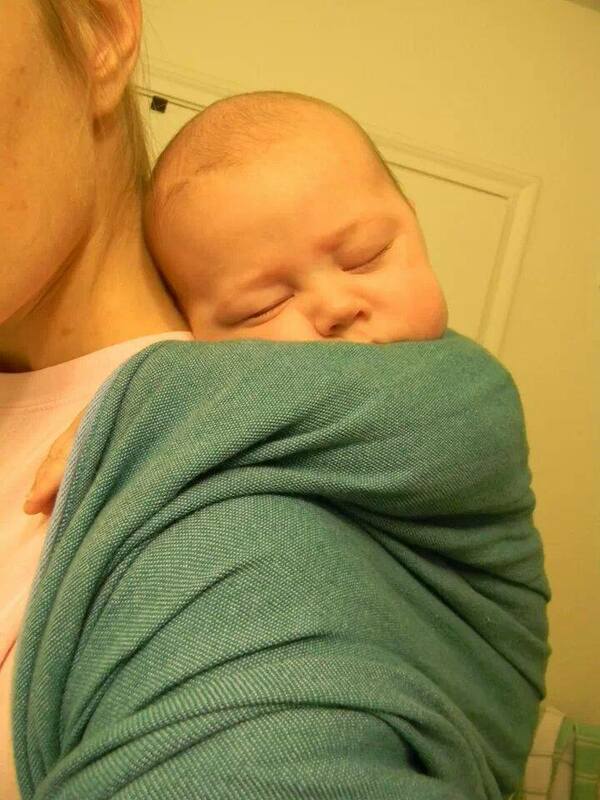 *For babies under 4 months of age, the Pognae Baby Carrier should be used with the Infant Insert accessory. 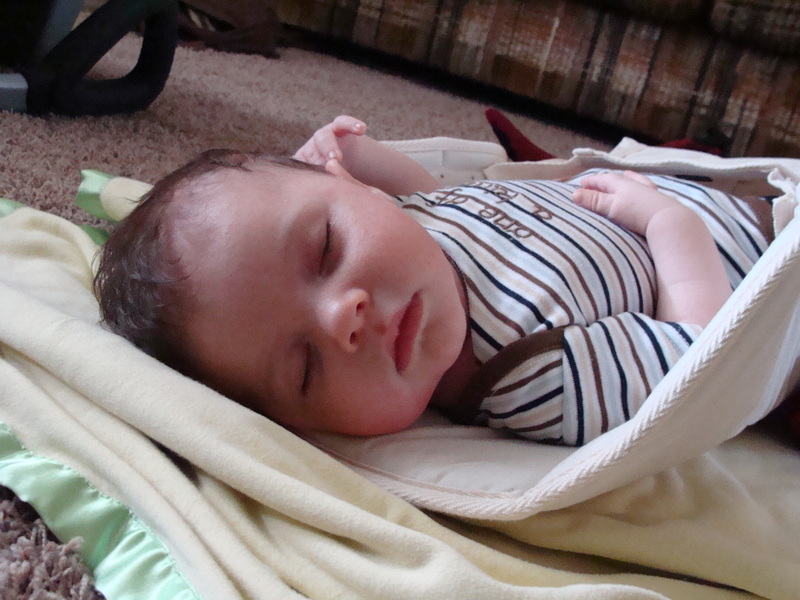 Using the infant insert at approximately 2 months old and 11 pounds. 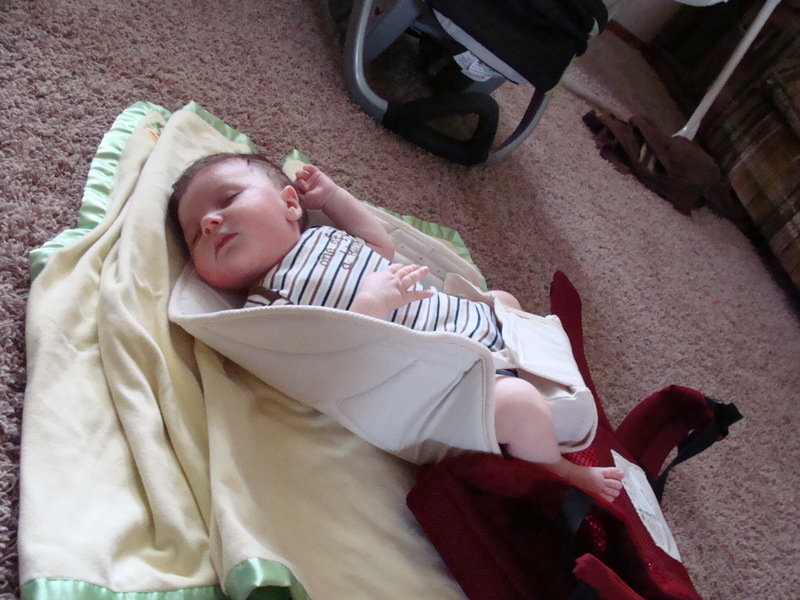 We loved the infant insert when baby would fall asleep–so easy to transfer a sleeping child to/from carrier to carseat to carrier to bed, etc. One more picture of s a sweet sleeping baby. 15 months old an approximately 22 pounds. 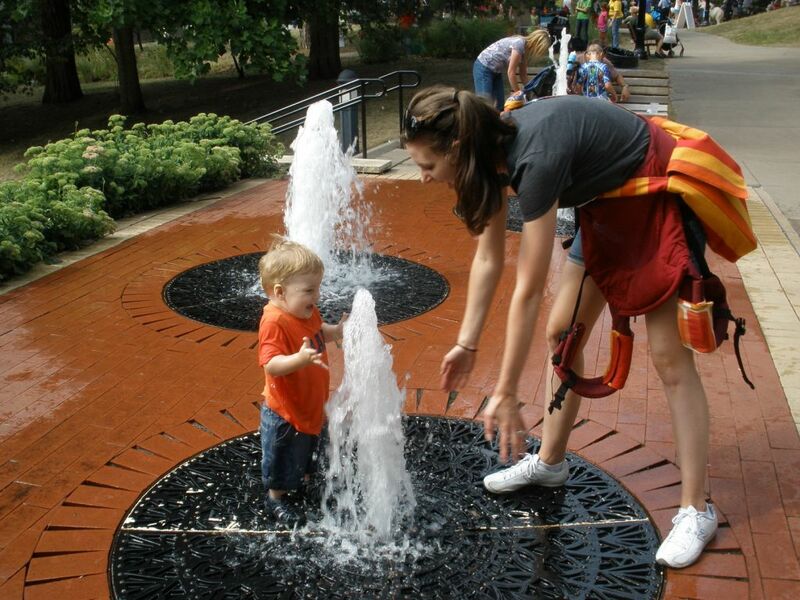 Taking a break from babywearing to play in the fountain. First back carry around 4 months. Here’s some of our group member’s favorite green wraps they offered to share this St. Patrick’s Day! I’m loving all the green. 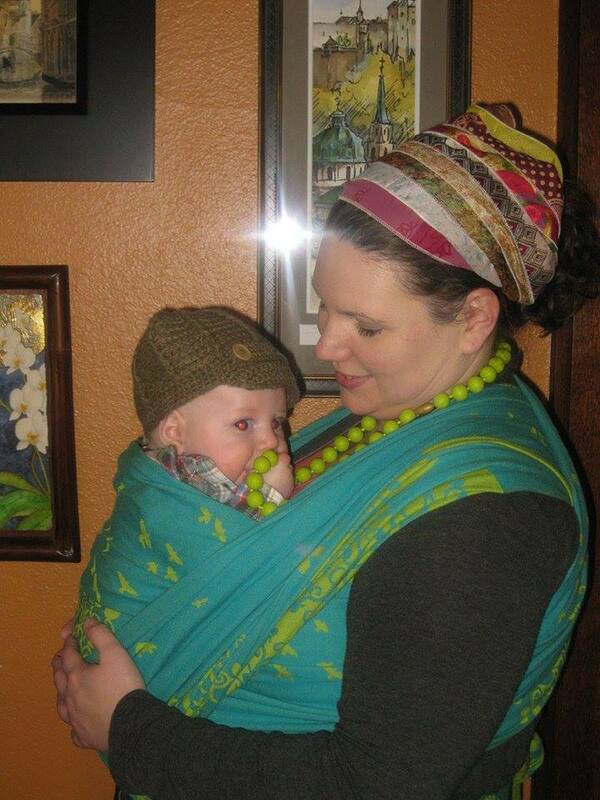 Kathy and her little one love the look of Elias in Wonderland this St. Patrick’s Day! 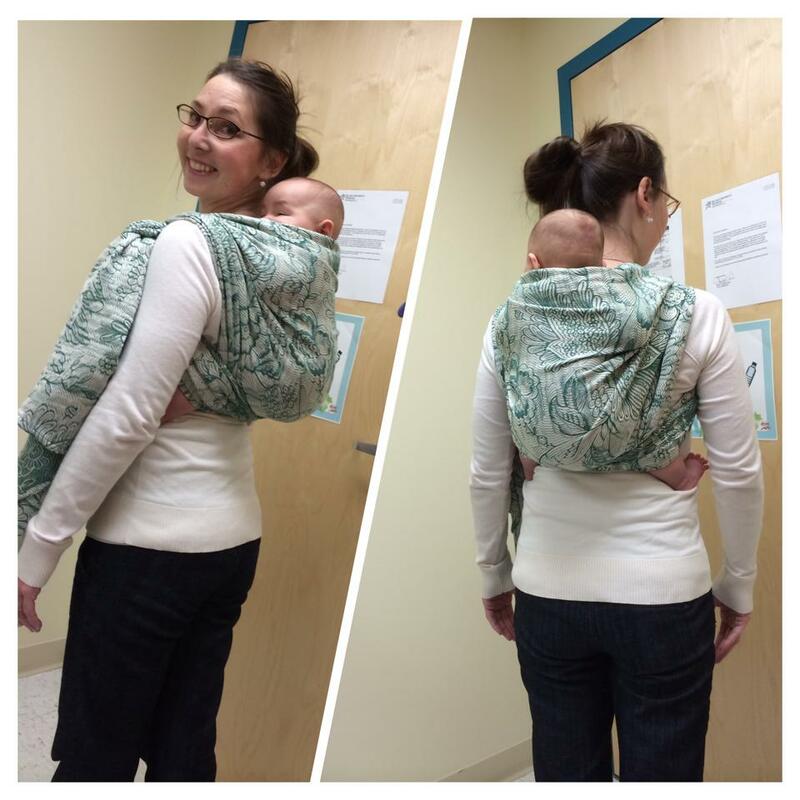 Sleepy babies love back carriers in their favorite green didymos. 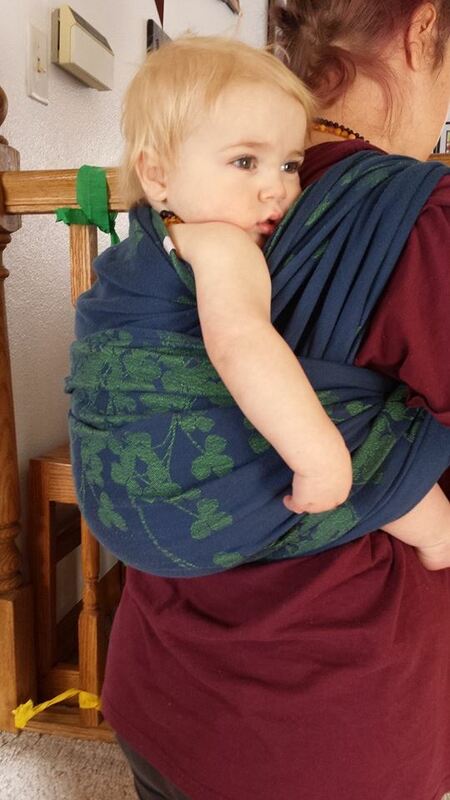 Even toddlers love uppies in Natibaby clovers! Didymos Ginkos is a BWI of Central Iowa favorite and can be checked out from our lending library. Sweet baby in her Pavo. People oftentimes wonder if it is possible to babywear through the airport. One of our members, Melissa, has volunteered her experience. 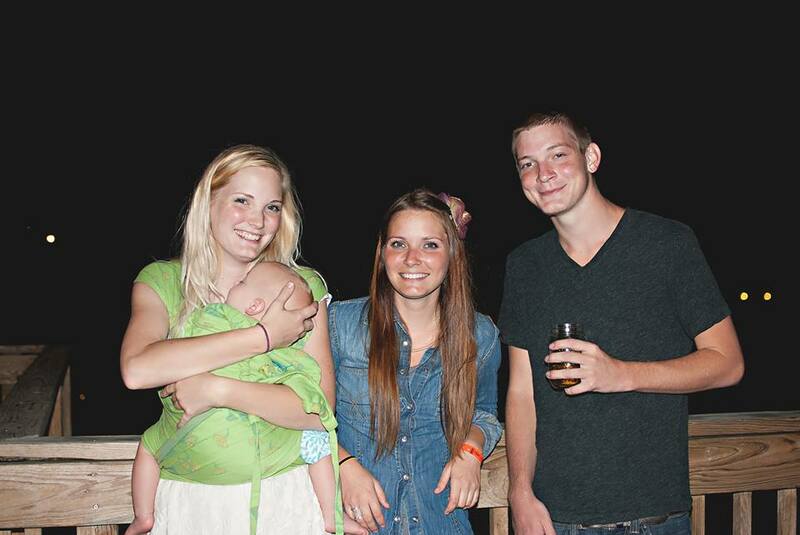 Melissa is a fun mom to Batboy, furry baby, and belly baby. 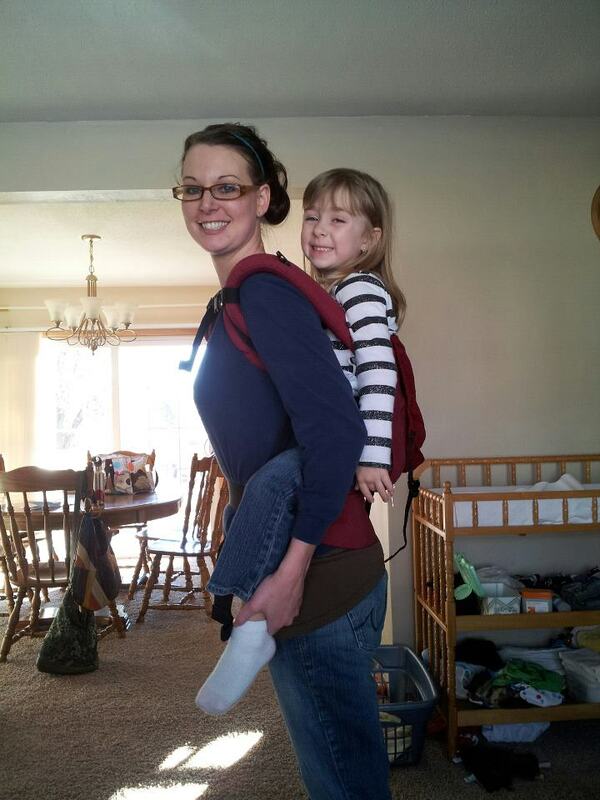 Her and her husband have been babywearing for 2 1/2 years and have traveled on over 10 flights with Batbay. Spring break is in less than a month, and summer will (hopefully) be here before we know it. It is that time of year again to start thinking about airplane travel with baby. Many of you have had questions about wearing baby while traveling via an airplane. Hopefully I can help answer some of your general questions about what to expect while in the airport and on the plane. All of the official TSA rules and regulations can be found on their website http://www.tsa.gov. Brad Pitt and Angelina Jolie are NOT members of BWI of CI, but they do wear their babies while traveling. Wearing baby makes getting through the security checkpoint much less stressful, especially with multiple children. 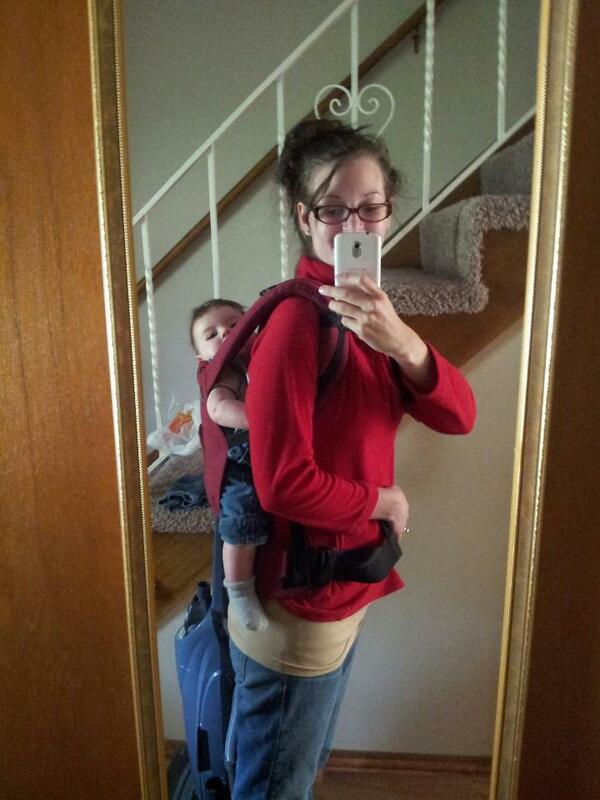 Pick a carrier that you are most comfortable with. Make sure the carrier is metal free. After walking through the metal detector with baby in a carrier, you will be required to have a hand swab which tests for explosive residue. It is a quick test and only takes a few extra minutes in security. Some lotions, makeup, and baby products can cause a false positive test result, so try to refrain from using any of those products until after going through security. A great deal of airports will let you wear your baby through security, but keep in mind that the final decision is up to the security officer. 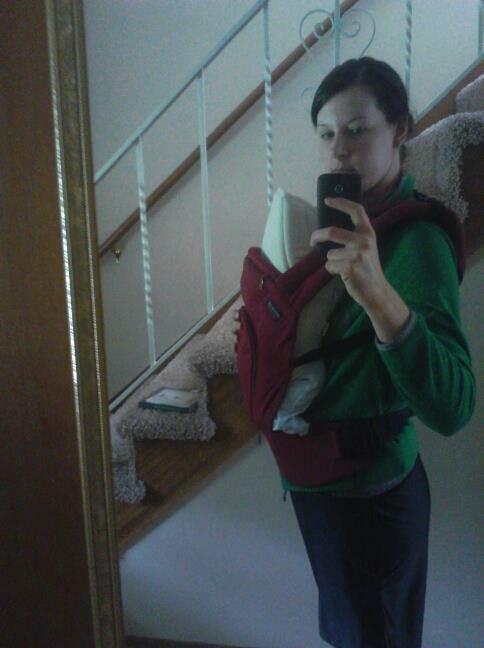 They can ask you to remove baby from a carrier and carry them in your arms. You have two options when flying with baby, keep baby in your seat as a “lap child” (until they reach the age of 2 years) or buy baby his/her own seat. It is recommended by the FAA to buy baby their own seat and secure them in a car seat that is certified for air travel. If you choose to fly with baby as a lap child you can keep them in a carrier during the time the seat belt sign is off. It is regulation that you cannot keep baby in a carrier during take off or landing. That said, it is up to the flight attendant whether they will ask you to remove baby from the carrier or not. 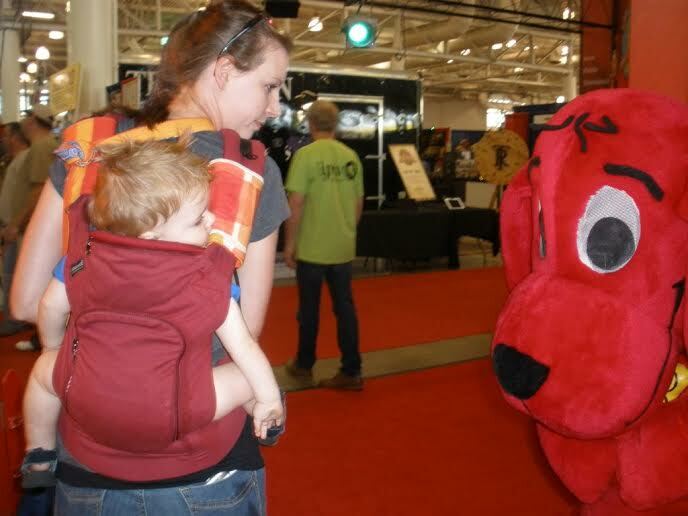 If you are taking a car seat for your lap child, it is recommended to gate check it. It is less likely to sustain damage and/or get lost if it is checked at the gate versus getting checked with your luggage. You may also want to check with the gate to see if there will be any empty seats on the plane, as you may be able to use an empty seat for baby. -Take new toys for baby and only give them one every 30 minutes or so. -Nurse or bottle feed baby during take off and landing to help their ears pop. I’ve heard a pacifier also works great. -Take extra clothes for mom/dad and baby in a carry on bag just in case. -Take lots of snacks and a sippy cup in your carry on bag. -At the ticket counter, ask for a plastic bag for anything you will be gate checking (Ex: stroller, car seat). They generally don’t have these available when you board the plane. -When possible, walk up and down the aisle with baby if they are fussy. – a West Des Moines morning meeting on the first Tuesday of the month at 10am at United Methodist Church on the corner of 8th and Grand. -an Ankeny meeting on the second Thursday of the month at 6:30pm at the Kirkendall Public Library. -a West Des Moines evening meeting on the third Tuesday of the month at 6pm at United Methodist Church on the corner of 8th and Grand. -a South Side meeting on the fourth Monday of the month at 6pm at the Indianola C.U. Church. These meetings will occasionally change date, but you can find more info in our facebook group, Babywearing International of Central Iowa. We have libraries at each location and there are Volunteer Babywearing Educators available at each meeting to help instruct and troubleshoot any carrier.